Our pretty new fern shopping basket is filled with gourmet Florida Citrus and tropical goodies. With tree-ripe seasonal Florida Oranges (we use our famous Navels November - January), or choose a mix of Oranges and Ruby Red Grapefruit. 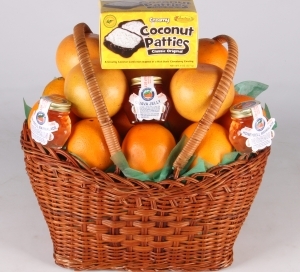 Includes a half-pound box of chocolate-dipped Coconut Patties and mini jars of genuine Florida Orange Marmalade, Guava Jelly and Honeybell Marmalade.